The automotive industry is evolving at an unprecedented pace. Software companies continue to drive innovation in the industry, which was evident at the 2019 North American International Auto Show (NAIAS) – the largest auto show in North America. 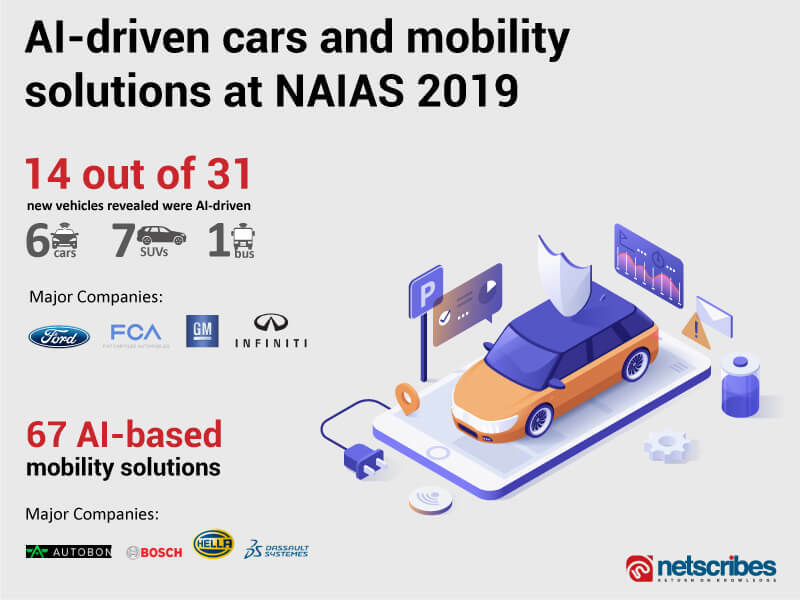 As thousands of startups, innovators and industry giants from over 25 countries came together to showcase their latest mobility innovations, Netscribes took a closer look to uncover the industry-changing trends to watch for in 2019 and beyond. AI is transforming the automotive industry in every way imaginable. From enabling material procurement and predictive maintenance in the manufacturing process to powering autonomous cars, AI is at the heart of it all. This was evident at the NAIAS, where nearly half of the vehicles displayed had some form of AI integrated into them. 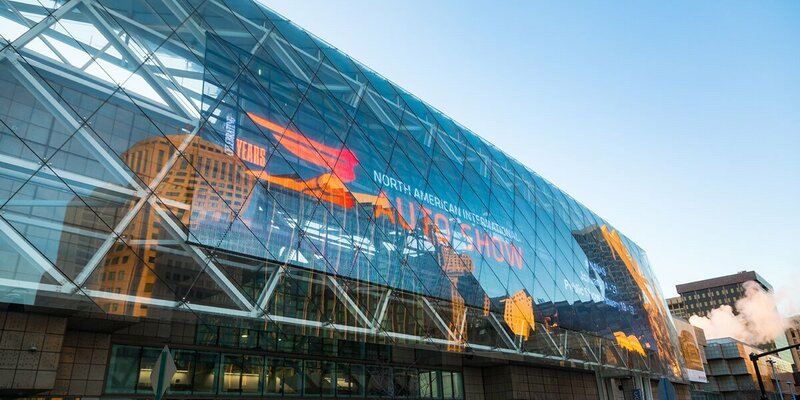 Autonomous mobility emerged as the key trend in auto technology at the NAIAS 2019, with over 41 self-driving, sensor-based, and navigation-based technologies displayed at the show. In addition, 21 Vehicle to Infrastructure (V2I) connectivity solutions, enabling autonomous and self-driving cars, were showcased at the event. Magneti Marelli, an Italian automotive tech company, unveiled its latest Smart Corner technology that integrates autonomous sensors into headlamps and tail lamps to provide the required functionality for autonomous driving. This includes autonomous signaling and improving the communication between the vehicle, its occupants and the surrounding environment. In addition, the technology includes an interactive external virtual assistant that performs tasks such as opening doors by leveraging V2X. Lightning and electronics specialist HELLA showcased their smart OLEDs along with 24 GHz radar sensors with enhanced detection capabilities. 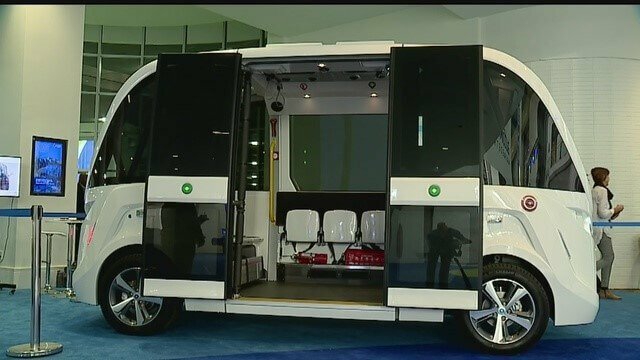 Navya, a French Autotech company, revealed its all-electric and 100% driverless minibus that’s being used to shuttle passengers around downtowns, entertainment districts and parking lots. Innovative car subscription services are making headwinds in the auto industry as consumers increasingly trade renting or purchasing of cars for the convenience and cost-effectiveness of subscription programs. Leading car manufacturers such as BMW, General Motors, Ford and Volvo have already entered this space in response to this market shift. Fiat Chrysler Automobiles has partnered with Turo, a car-sharing startup, to allow its customers to rent out their vehicles through the platform. The automaker has also partnered with Avis Budget Group Inc. that will let owners swap their Jeeps for other vehicles. In a similar move, General Motors started a program that lets customers rent out their GM vehicles using its car-sharing platform, Maven. As the world gears towards an all-electric future, automakers around the globe are developing more electric vehicles and improving the charging infrastructure to enable the mass adoption of electric vehicles. Leading automakers like Kia, Audi, BMW, and VW plan to introduce several fully-electric vehicles over the next couple of years to capitalize on the electric opportunity. The biggest head turner at the NAIAS was General Motors’ all-electric Cadillac, which uses the company’s latest EV architecture. 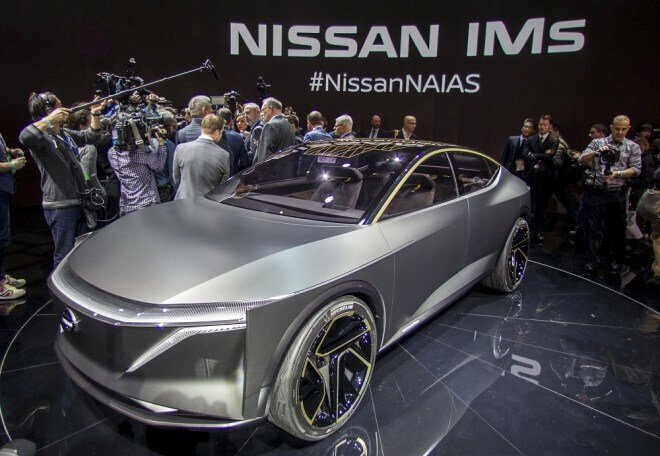 Nissan unveiled an elevated sports sedan called the IM concept EV. The company plans to launch seven such electric vehicles by 2022. Volkswagen, on the other hand, announced an $800m investment to build electric vehicles at its Chattanooga, Tennessee, plant beginning in 2022. As cars become more connected and reliant on wireless technologies, cybersecurity safeguards have become imperative. Automobile manufacturers are therefore partnering with technology providers to integrate cybersecurity solutions that offer protection from unauthorized access, damage, data theft, and other cybersecurity risks. Last year, Blackberry CEO John Chen introduced Blackberry Jarvis, an automated cybersecurity solution that analyzes a vehicle’s software code and provides diagnostic feedback to help auto manufacturers develop secure connected-cars. Blackberry has already begun Jarvis trials with some of the world’s largest automakers. In an independent study by Jaguar Land Rover, Blackberry Jarvis reduced the time to assess code from 30 days to just seven minutes and identified more security issues than security researchers. The automotive industry is experiencing a transformative wave, driven by rapid innovation and market and regulatory changes. Netscribes helps companies in the auto industry to keep up with these changes and inform strategic decisions by leveraging the power of data. To know more, contact [email protected].